Working with athletes of many disciplines affords me an opportunity to look at many shoulders week to week. Increasingly, I am seeing more Crossfit athletes for various shoulder problems. In many cases, they have rotator cuff tendonitis, impingement, AC joint pain, labral pathology or a combination of the aforementioned issues. The other big group of athletes I see is throwers. These two groups share many of the same dysfunctions including posterior shoulder tightness and decreased mobility. Tightness in the pecs and lats is commonplace. I feel latissimus tightness often goes unnoticed or perhaps is not an area of emphasis in prehab/rehab plans. Tight lats will restrict elevation and contribute to postural dysfunction. With restricted elevation, athletes may turn to excessive spinal extension and/or rotation to achieve elevation necessary (e.g. overhead squats, snatches, throwing) and this can contribute to poor movement patterns. I have also seen this impact volleyball players asymmetrically with serving and hitting. Lat tightness can easily be assessed by placing the athlete supine and simply asking them to bring the arms completely overhead. While most people do not have 180 degrees of flexion, I feel working to achieve elevation greater than or equal to 160 is completely reasonable. The body often uses abduction and external rotation to make things work (and this is natural for throwers), but the more pure elevation capacity we have the the better. Crossfit involves lots of pull-ups and throwing heavily utilizes the pecs and lats for acceleration. It only follows that muscular tightness in this region may need to be addressed. Step one often involves soft tissue mobilization/compression techniques. I prefer to use a Trigger Point ball or Grid to work on the soft tissue mobilizing it on the wall (TP ball) or floor (Grid) in an elevated position. Next, I like to employ active mobility work. 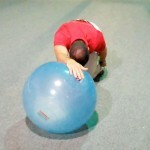 I recently featured a simple exercise using the BOSU Ballast Ball in my PFP column. The pictures below reveal a rolling double arm version, as well as a single arm method/progression. These active movements can also be complimented by sustained holds as desired. For a more detailed description and application of this exercise, click here to read my “Functionally Fit” column. I had one Crossfit enthusiast see me for limited shoulder mobility as it was hindering his overhead lifts and causing back pain. He had about 130 degrees of shoulder flexion. Daily STM using the foam roller, mobility work and some stretching increased his elevation by 10 degrees in 2-3 short weeks. So, the take home message is that overhead athletes should assess and address this limitation if it is present as it may cause kinetic chain issues and energy leaks. Improving mobility will better enable utilization of proper muscle activation and optimal movement patterns.